Earlier topic: What typeface is this? 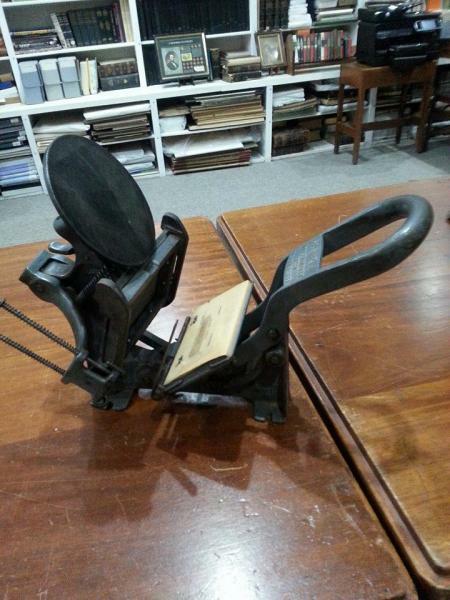 I recently had this press donated to a museum but am having a hard time finding this exact one. There are many similar but the markings are just slightly different. I found one on Ebay but there was very little information on it. Thank you for any help you can provide. looks like the one I got back in 1961.
they made slight changes in their presses over the years but I don’t know if accurate dates can be determined because I don’t believe there are serial numbers on these presses. The one who might know would be Alan Runsfeldt from Excelsior Press in Frenchtown, New Jersey. The year and month of manufacture should be stamped on the chase bed in — I think — the upper half. Remove the chase and the bed and find the numbers and letters engraved on the bed. The first letter indicates the chase size, the second set (numbers) indicates the year of manufacture, the third element, a letter, indicates the month (where A= Jan, B=Feb, C=March, etc.). I will attempt to append a picture. P.S. Of course, if the chase bed was swapped out, you have an archaeological red herring. I never knew the dating scheme before, so I went down to the shop and checked my two Kelseys. 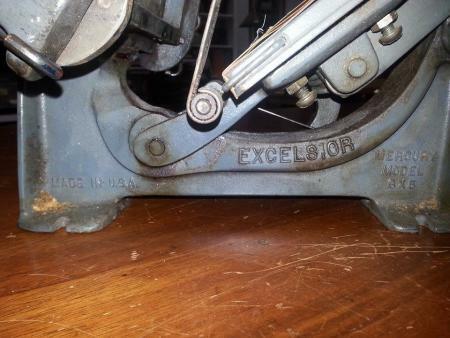 The 5x8 (my very first press) is stamped with the code and was manufactured in 1942. Neat! I then went to check the 3x5 and there is nothing there!!!!!!!! No code whatsoever. I probably picked this little press up decades ago and even then it appeared to have a lot of age on it. 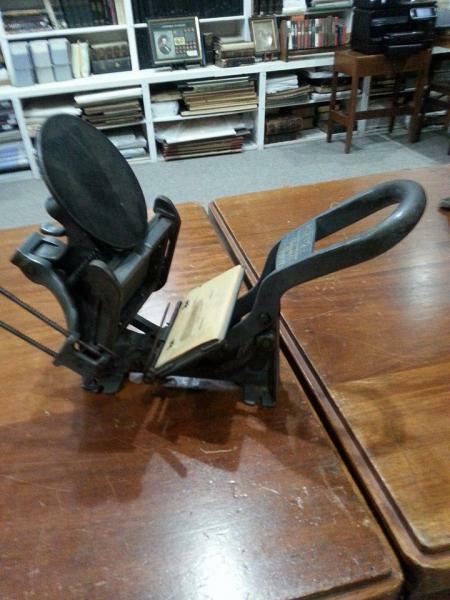 When did they start stamping a code into the press beds???? If I knew that then I could assume mine is an earlier manufacturing date than that. Just a thought and ramblings from afar, in your 4th. and sixth shots there is patent implications/marks, strange logic implies that there is somewhere patent rights and or drawings in some long forgotten but NOT yet erased archives.??? Have you done a thorough search around and under (within the base even) for identification marks. Have you flipped the Top Bale Arm for serial numbers stamped into the top of the Platen Proper. In the case of our Adana,s (and the Ajax) The serial number, and PREFIX are always stamped in, as above, i. e.either in to the top of the platen proper, or in the side of the Platen proper, Left side facing the M/c. operators perspective, not covered by the Tympan/Top sheet , just a possibility, apologies otherwise.!!! @Foolproof: Rick, I have two Kelseys, one a 6x10 made in 1979, so marked on the press bed. 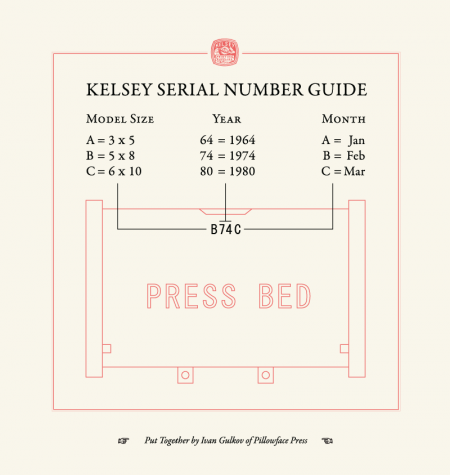 My first press, a Kelsey 3x5, is also marked on the press bed (January of 1966). So, Kelsey was marking their presses in the mid ’60s, at least. We have a number of new Kelsey 3x5 chase beds cast out of aluminum that were made for hot foil stamping but there is no date stamped in them. These came from Kelsey back in 1993 when Hal Sterne purchased what was left of the company as far as anything of commercial value. 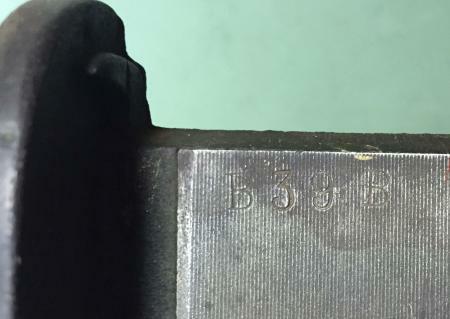 And then I checked the bed of my 6x10 Kelsey that I purchased new and it has April 1954 as the date. I recall getting the press in June of that year and that event changed my life forever. That will be 62 years in 3 more months. I checked our Model O 5x8 - number B39B. 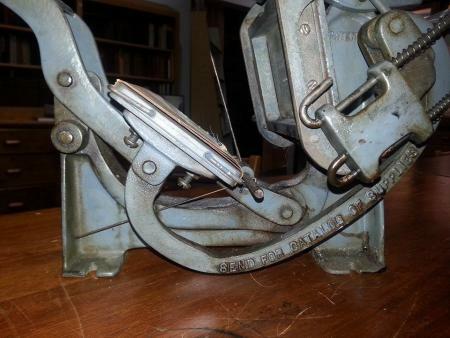 So I guess Kelsey was marking presses at least as far back as 1939. Thanks for your help everyone. There are no markings without taking some of it apart as some suggested. I’m a novice with this so I found someone here locally who is going to stop by and check it out. I’m afraid to start taking things apart without having someone here more qualified. Sorry for the late response, I run a museum almost entirely by myself so it’s easy to get sidetracked with other things. My rollers should finally come in by the beginning of next week so I will be giving this thing attention again soon and will let everyone know what I either do or don’t find out.